Live like a rock 'n' roll superstar at the exciting Hard Rock Hotel at Universal Orlando® You’ll feel like rock 'n' roll royalty with impeccable accommodations, a wealth of recreation and personal service and attention fit for an "A-List" celebrity. The Hard Rock Hotel is lively, yet laid back. Classy, yet totally casual, with a sand beach pool that immerses you in sound, not just water; authentic rock 'n' roll memorabilia; the legendary Palm Restaurant and more. 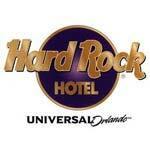 You don't have to be a rock star to stay at Hard Rock Hotel. But after just a few hours, you’ll definitely get used to living the lifestyle. Guest Rooms from 375 sq. ft.